« How Much Sand Do You Need to Build a Pool? There is a lot of scientific work done with regards to the reduction in caloric intake required to achieve a particular weight loss goal. 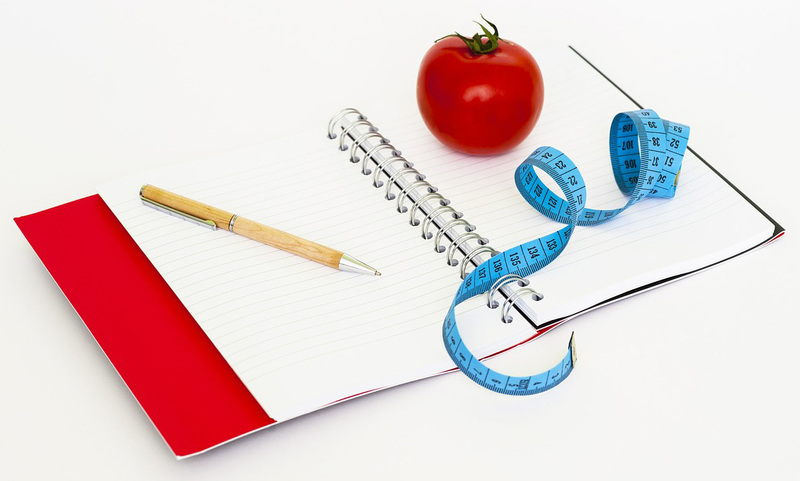 The mathematics behind the science of weight loss are, in fact, quite fascinating and in this article we will go over them in some detail. In doing so, we will address a common myth: that reducing your caloric intake by 3500 kCal for a week will result in a weight reduction of about 1 pound (0.454 kg) over that week. The latter is a very pervasive myth propagated by many fitness, well-being and weight loss websites including the likes of Harvard Medical School  , Mayo Clinic  and the U.S. Surgeon General . Debunking this myth can help people get a better grasp on what it takes to lose weight. The claim that in order to lose one pound of body weight per week you need to reduce your caloric intake by 3500 Calories per week (500 kCal per day) is a very pervasive myth which can be traced back to a 1958 paper  . In that paper human adipose tissue, where fat is stored, was calculated to contain the energy equivalent of 3500 kiloCalories. This lead to the conclusion that you must reduce your weekly food intake by the equivalent of 3500 Calories. This ubiquitous weight-loss rule […] was derived by estimation of the energy content of weight lost but it ignores dynamic physiological adaptations to altered body weight that lead to changes of both the resting metabolic rate as well as the energy cost of physical activity. Unfortunately, this static weight-loss rule continues to be used for weight-loss counselling and has been misapplied at the population level to predict the effect of policy interventions on obesity prevalence. Understanding why the 3500 Calorie rule is a myth isn’t that difficult even to the uninitiated as long as they have expressed some interested in the mathematics of losing weight. The basic idea of weight loss science is to induce an imbalance between the energy you receive from food and the energy you expend in your daily activities. To visualize this from a math perspective, if I is energy intake and E is energy expenditure, we want I to be less than E on a daily basis: I < E, which would, by the law of energy balance, lead to a reduction in weight as the body compensates the difference E – I by using up energy stored in different body tissues. However, when you reduce your energy intake your body does not compensate for the difference by using only stored fat, which is an assumption behind the 3500 kCal rule. Your body also “burns” proteins and carbohydrates from body tissues which compose fat-free mass (FFM or LBM, lean body mass) such as the short-term glycogen stores, muscle, and others. The proportion of fat to fat-free mass lost during a calorie restricted diet varies depending on their initial ratio. 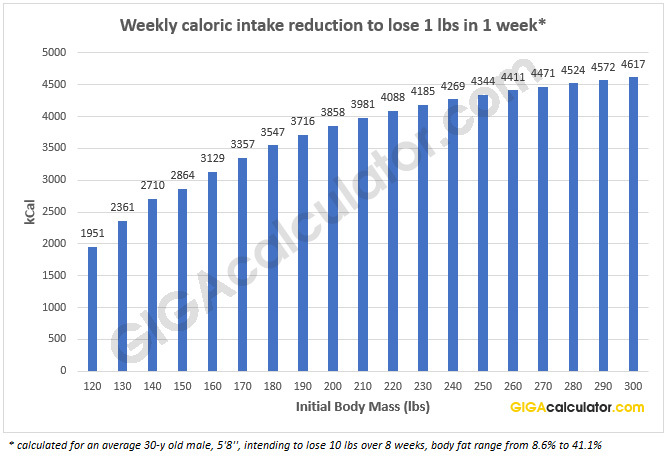 Since the initial ratio changes dynamically, week over week, the proportion and thus the calorie deficit required changes as well. Due to the vastly different energy densities of pure fat (9500 kCal/kg or 4313 kCal/lbs) and fat free mass (1000 kCal/kg or 454 kCal/lbs) any change in the proportion can have a significant effect on the actual reduction in body weight since getting 2000 kCal from fat-free mass will reduce your weight by about 2 kg (4.4 lbs) while doing the same from fat mass will only reduce it by 0.21 kg (0.46 lbs). This simple math proves quite eye-opening. Other factors influence the calculations in a dynamic way as well. For example, reducing the food intake also reduces the thermic effect of food (TEF, a.k.a. dietary induced thermogenesis or DIT). As result, you expend less energy to process and store energy from food which feeds back into the weight loss calculation and lowers the expected weight reduction. Simple attempts to “fix” the 3500 kCal per lbs of lost weight rule might attempt to propose a higher or lower numerical value. However, such attempts are doomed to fail since a lower value for the energy content of lost tissue will still not account for the dynamics of losing weight. The rule of thumb approximately matches the predicted energy density of lost weight in obese subjects with an initial body fat above 30 kg but overestimates the cumulative energy deficit required per unit weight loss for people with lower initial body fat. In  Hall states that the 3500 kCal value is appropriate for modest weight changes in overweight and obese people, but is an overestimate in others. GIGAcalculator.com performed a set of mathematical calculations using a weight loss calculator which estimates how many calories you need to eat to lose weight through formulas more reflective of the dynamic nature of the process and correctly reflects the influence of the difference in both initial body weight (and thus fat mass, body fat percentage) and the amount of weight you aim to lose over a given time period. The results below are for an average 5 feet 8 inches tall (~173cm) 30-year old male, assuming his goal is to lose 10 lbs (~4.5 kg) over 8 weeks without changing his current exercise routine equivalent to “light exercise”. As you can see the values are about 3500 kCal/lbs per week only for a narrow range which corresponds to a mildly obese person, even though 10 lbs is not a big amount and thus the rule of thumb should work relatively well. The graph clearly shows that the rule is significantly overestimating the required caloric reduction to lose a pound of weight if you are already fairly slim, and that it significantly (up to 32%) underestimates it for obese and very obese people whose body fat percentage is significantly above average (graph goes up to 41.1%). What this shows is that there can be no rule of thumb in terms of the number of calories one should eat when it comes to weight loss. The calculation for each person will vary heavily, mostly depending on their initial body weight and how far the weigh loss goal is from that initial mass. What Does the Math of Weight Loss Tell Us? What we have established, even without going into how the body adapts to caloric deficiencies by reducing involuntary body movements and making others more efficient, is that if you are already slim, you should not reduce your caloric intake as drastically as 500 kCal/day as a significantly milder intervention will result in ~0.45 kg of lost weight due to your leaner body composition. At the same time the math tells us that it is significantly harder to lose weight if you have a high body fat percentage than the 3500 Calorie per pound rule might make you believe. The more obese a person is, the more misleading the rule of thumb is in their situation. One might need to cut their caloric intake by as much as 4600 kCal per week or even more, depending on the specifics. If you want a more realistic estimate of the dietary change you need to commit to in order to lose weight, you can consult GIGAcalculator’s weight loss calculator as well as the U.S. NIH weight planner. Both tools allow you to also incorporate a change of your physical activity level in your estimate. Doing the math is, of course, just the first step. Sticking to your chosen daily calories is difficult and even the best estimate can’t help you fight the physiological and psychological challenges of losing weight permanently since our bodies are generally inclined to preserve what was the norm for them for a fair amount of time. An applied statistician, data junkie, and optimizer by calling. 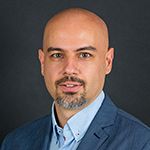 I have expertise in web analytics, statistics, design of experiments, risk management and cover a variety of topics where mathematical models and statistics are useful.